It’s episode 30! 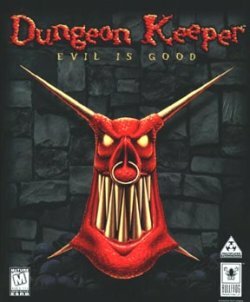 This time around we’re talking about the unique 1997 Bullfrog franchise, Dungeon Keeper. The creators of The Incredible Machine are coming out with a new game called Contraption Maker. A movie project called Video Games: The Movie attempts to communicate the love of video games from the people that made them. A unique adventure game project called Armikrog has some cool looking graphics and an interesting voice cast. Finally, the new Leisure Suit Larry has been delayed by a month due to bug fixes. Finally, we get on to the main event: Dungeon Keeper. We cover all the bases of this fun and unique game series. Next time, I’ll be covering the infamous Duke Nukem series. Hey Joe and fellow Blockers! Yup, that was me about Myst 3 coming packed with a copy of Myst 4 I’d bought in retail (Best Buy IIRC) a few years back. The two games seem harder to come by today with Myst 4 priced at 75$ on Amazon!! A customer image does have “this limited edition includes Myst 3”, but not sure if that’s still the case. Love the podcast about Dungeon Keeper! Although I will say that I usually build 5*5 rooms, I like to be nice and comfy in my dungeon. I don’t recall anything about the “temple recipes” in the manual, I’m fairly certain I had to look it up. It was up to the player to experiment and toss his minions into the swirling magical vortex! Which could reap a couple of surprises, just try dropping a chicken in there, or some gold… The Horned Reaper recipe was Dark Mistress, Troll and Bile Demon, of that I’m certain, I loved Horny!! 😀 That game really was great, full of snark, humor and references (the ultimate hero of the land is called the Avatar). Glad you still recommend the games, I guess I’ll have to go back and try out #2 some time! Absolutely looking forward to Duke Nukem, now there’s a minefield if there ever was one! A dinosaur of another era, that’s for sure! Thanks! Yeah DK2 is really much, much more playable. It’s definitely an idea, the game club guys actually suggested it to me themselves. Something to look into going forward! I think you should really put your mind to it 🙂 Speaking for myself, it’s more entertaining with visual cues, even though you don’t have to watch the whole hour, but just peek occasionally (although I’m working on two monitors and use the second one for that). And thanks again for what you’re doing, best of luck!